That's it then in Dubai! Tim Paine and Nathan Lyon have taken Australia through for a draw in very tense circumstances against Pakistan in the first Test match of the series. The umpires call it off a ball before scheduled close of play. FIFTY! That's a well played half-century for the Australian captain Tim Paine. Couple of runs to the offside gives him his half-century and keeps Australia afloat for now. OUT: Yasir Shah has struck again. Peter Siddle is out LBW for 0 and Australia are on the brink of defeat. That's Shah's third quick wicket. OUT: Mitchell Starc (1) is caught by Babar Azam of the bowling of Yasir Shah. That was a fantastic catch at short square leg. The win is truly on for Pakistan now. OUT: Finally a wicket for Pakistan, as Australia's Usman Khawaja (141) is given LBW while he attempted to play the sweepshot to Yasir Shah. That's a huge breakthrough. Sarfraz Ahmed: All the credit to the Australians and specially to Usman Khawaja for the way he batted through the day and saved the match for his country. I knew he understands Urdu, but he played the sweep and reverse sweep very well against our spinners. We need to continue to work hard and keep learningthrough the Test. Tim Paine: This was an extremely tough Test match and Pakistan had us under the pump for a long long time. But I am proud of the way we played. We had a plan and we stuck to the plan. Usman was looking to be positive throughout and I am very happy with the way we prepared. I was nervous, but once you get set here it becomes a lot easier. Usman Khawaja: I wasn't really thinking too much and we believed that we could do it if we batted well in the first session to start with. Once we did that we knew we could take it to the end. Credit to Pakistan as well, they played in tremendous spirit. Every time you get a hundred for Australia it is an amazing feeling and I am very privileged to be playing for them. There was rough on both sides of the wicket and that is why I looked to reverse sweep things from there. This has been a great effort on the part of the Australian captain Tim Paine and Nathan Lyon. Another Bilal Asif over played out and six runs added to the total as the last over of the day and the match. Who will hold their nerve? Couple of overs left to go in the match now and Yasir Shah's attempts to dislodge Tim Paine were in vain as the Australian captain holds out for another over. Sarfraz has both his spinners functioning now, with Bilal Asif coming in from the other end. He bowls a maiden over as Lyon plays it out in a calm manner. Matter of three more overs for Australia, while Pakistan need two deliveries to wrap it up. Tim Paine plays out another maiden over to Mohammad Abbas. Now there are four overs left for Australia to survive while Pakistan need just two good deliveries to wrap this up here in Dubai. Can Paine do a Steve Waugh in what is his first Test tour? Nathan Lyon is proving to be a big asset at the crease as a batsman for Tim Paine. Plays out a maiden and keeps Yasir Shah out for another over as the close in fielders keep the chatter going. This partnership does bring up memories of Steve Waugh batting with the tail enders during his time. Australia were of course a far more dominant force then. Nine runs of the Mohammad Abbas over as Tim Paine finds a boundary and takes a couple of runs in the second half of the over, after Nathan Lyon managed to squeeze it out of the tight circle of close fielders, five, that were waiting for a catch to complete another wicket. Paine is doing a great job as he tries to take his team through for a draw. Change of ends for Yasir Shah as he comes back and attacks the Australian captain Tim Paine. But the wicket-keeper batsman keeps his calm, gets his fifty and keeps his team afloat here under immense pressure. Surprisingly, Sarfraz brings Mohammad Abbas into the attack in place of Yasir Shah. The fast bowler bowls a maiden, but was that the right call one has to wonder after the three deadly overs by Yasir. Pakistan still need two wickets to win. Asif bowling with three fielders close in on the leg side for Tim Paine. Asif though gets smashed for a boundary of the fifth ball, and Paine will surely be looking to complete his half century before anything else. He is on 47 and has Nathan Lyon for company with Yasir Shah bowling with his tail up from one end. Maiden over from Yasir Shah after the two wicket taking overs before that. Nathan Lyon successfully gets those six balls out of the way. Tim Paine at the other end will be hoping he can continue doing that for a while. Bilal Asif bowls a great over. Five fielders around the bat and Paine plays out the whole over safely only taking a couple of runs of the second ball. Time for Yasir Shah, can he wrap this up? End of what was a very eventful Yasir Shah over and a maiden to add to that. Pakistan took two wickets in the over and are two wickets away from the win. Since Usman Khawaja was dismissed, the rest are falling like a pack of cards here in Dubai. Australia are 335/8 with Tim Paine and Nathan Lyon at the crease. Bilal Asif rushes through the next over and concedes only a couple of singles. There is a lot of chatter around the Australian batsmen as the Pakistani spinners look to run through the tail. We are in for an exciting half an hour and a little more here in Dubai. Can Australia hold on? Maiden wicket over for Yasir Shah here at the top of the final hour in the Test match in Dubai. Can they polish off the tail? For now it's Mitchell Starc and captain Tim Paine looking to keep them out. Pakistan will now have a spring in their step as the Australian tail starting with Mitchell Starc is in now. Khawaja's review did not work out and it's advantage Pakistan now as they need only four wickets. Another over gone as Australia are inching closer to the draw. Maiden over this time from Yasir Shah. Bilal with a big caught behind appeal against Tim Paine was rejected and they could not review it because they are out of reviews. The rest of Asif's over produced very much apart from a single run of the last ball. Three runs of Mohammad Abbas' over. It could have ended as a maiden over, if not for the attempted yorker which came a full-toss for Tim Paine and he promptly played it away for three runs. Score 329/5 after 122 overs. 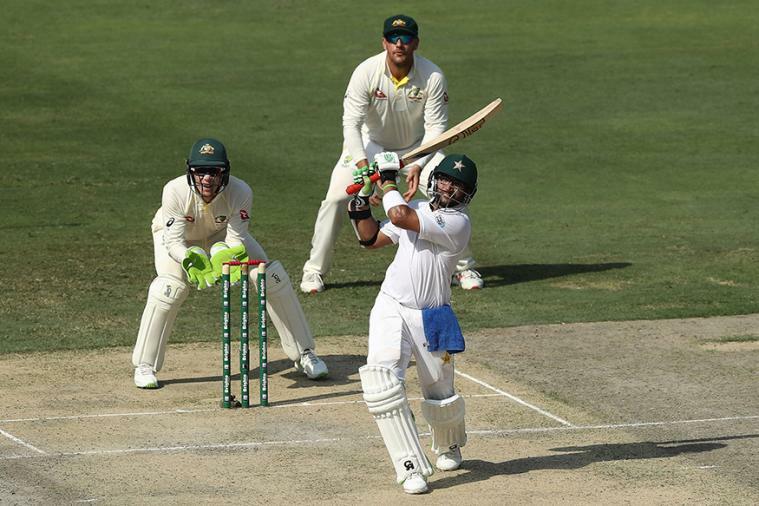 Pakistan batsman Imam-ul-Haq has been ruled out of the second Test against Australia after fracturing his finger on Day five of the first Test in Dubai. Two runs of the next Bilal Asif over. Both Paine and Khawaja take a single each and watchfully play out the rest of the over. Less than 20 overs to go in this Test now for Australia to hold onto. Catch all the live updates from Day 5 of the first Test between Pakistan and Australia in Dubai. The match will begin at 11:30 AM (IST) and can be seen on the Sony ESPN and Sony ESPN HD, as well as streamed live online on Sony LIV. Preview: Mohammad Abbas unearthed the reverse-swing on offer on day four at the Dubai International Cricket Stadium and captured three wickets in no time to leave Pakistan in a strong position against Australia in the first Test on Wednesday. Resuming the penultimate day on 45 for 3, Pakistan, who amassed 482 runs in the first innings, scored at a steady rate before declaring on 181 for 6. Set a daunting 462-run target, Australia were 136 for 3, still 326 runs behind, with Usman Khawaja and Travis Head unbeaten on 50 and 34 respectively. Australia suffered the same fate they did in the first innings where despite Aaron Finch and Khawaja's splendid 142-run opening stand, the visiting team folded meekly for just 202. With a mountain to climb, the openers once again looked solid and played risk-free cricket to lay a good foundation. Playing his first Test, Finch looked in complete control and smashed five fours in different directions. The association had already reached 87 and Pakistan were desperate for the breakthrough. Like he did in the first innings, captain Sarfraz Ahmed turned to Abbas and the right-arm fast bowler once again delivered. The 28-year-old pinned Finch right in front of the stumps with a delivery that nipped back in from just outside off. Finch missed out on a fifty by just one run. Abbas was getting the ball to reverse and Shaun Marsh had no answer to it. His sorry form continued as he edged one to the keeper without opening his account. Before the dust had settled, Abbas also got rid of Mitchell Marsh (nought) to leave Australia in disbelief. The touring team lost three wickets on 87 and the ghost of first innings - where they lose 10 wickets for 60 runs - started hovering over them. Khawaja, at the other end, remained unfazed and finally found an ally in debutant Head to battle it out in the middle. Head played a couple of delightful shots against Bilal Asif, who scalped six wickets in the first essay, and Yasir Shah. In the process, Khawaja, who top-scored for Australia in the first innings with a knock of 85, touched the 50-run mark for the second time in this Test. The two shared an unbeaten partnership of 49 runs for the fifth wicket to ensure Australia end the fourth day with some hope of saving the Test. Earlier, opener Imam-ul-Haq added 25 runs to his overnight score of 23 and also shared a 65-run stand with first-innings centurion Haris Sohail. Left-arm spinner Jon Holland (3 for 83) dismissed Imam for 48, caught and bowled off a flighted delivery, before debutant Marnus Labuschagne trapped Sohail in front for 39 in the very next over. Babar Azam (28) announced his arrival with a six, and so did Asad Shafiq who took the attack to the spinners from the word go. Shafiq commenced with a stylish drive and conventional sweep before smoking Nathan Lyon (2 for 58) for a six over mid-wicket. However, the off-spinner got his revenge when Shafiq hit one straight into the hands of the deep mid-wicket fielder, and that's when Sarfraz made the declaration.